Having a modern scanner at our clinic makes a difference to patients. They don’t require a separate appointment elsewhere, diagnosis and treatment are quicker, consultants see finite detail whilst their patient is with them. 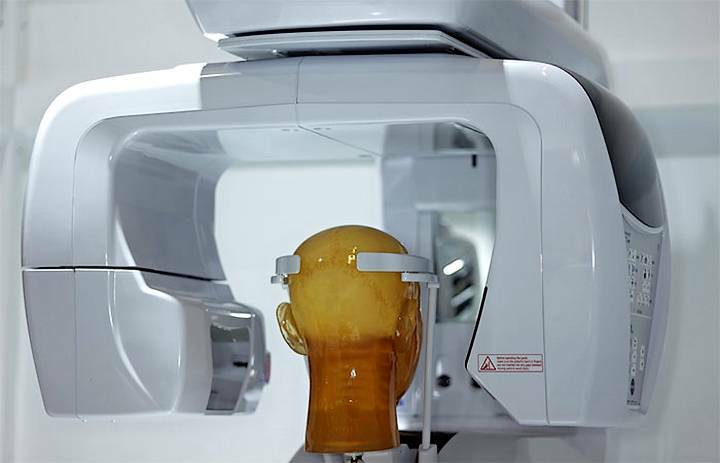 The cone beam CT scanner we use is designed for studying the maxillofacial region, producing in depth, 3D images, rather than the flat, 2D perspective standard x-rays provide. An advantage for diagnosis and treatment planning. For oral conditions, or complex dental work, a three dimensional view matters. The scanner could come into play to evaluate bone structure in your jaw, make good decisions on implant placement, or a wide range of anatomical assessment. As in a standard CT scan, a cone beam scanner uses x-rays but at 10% to 20% of the dose, depending on needs. Whilst consideration should always be given to x-ray exposure, particularly for children, a reduced dose is a safety advantage. While the scanner rotates around you, the images gathered are quickly processed into 3D visualisations. Positioning you takes just minutes, the scans themselves seconds and complete images are produced in a few more minutes. Scanning is entirely painless, no medical aftercare is needed, you will be able to eat, drink and carry on with your day as you wish. At the same time, your consultant has immediately available information on your condition. A cone beam CT scanner is ideally suited to the specialities our Harley Street clinic offers. This can help in diagnosing jaw tumours, or jaw joint disorders, seeing inside sinus, or nasal cavities, or analysing dental requirements. Soft tissue and bone can be looked at simultaneously, giving your consultant the detail they need for treatment, surgical, or restorative planning. The images can also give you a better understanding of what is happening in your own body. They help form a basis for the in depth consultation you came for. A first step in dealing with issues, restoring your health, the reason our clinic and staff are here supported by state of the art technology. The scanner is available to all departments and where using this makes sense for your needs, a complete explanation of procedure will be given. You are equally welcome to get in touch, if you have any questions on how 3D scans help.